Our goal is to create menu covers that get noticed, enhance business branding, and really last! 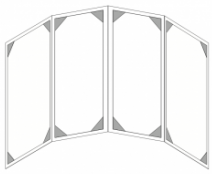 With 4 equally sized panels, the 4-Page Gatefold Menu is a chic option for any eatery. We make ordering online fast and easy! Just fill out the contact form below. If you would rather talk to someone in person, please call 1-888-478-5553. All of your information is kept confidential. Let’s begin by deciding on the size of your menu covers. This is determined by the size of your inserts, which is determined by the amount of text and pictures on each page. Below are the most popular options for the 4 page gatefold. If your inserts still need to be printed, let us know—we’d be pleased to assist.